As the new offensive force of artillery displayed its power in Italy in 1494, the first effective defense against that artillery was demonstrated also in Italy a mere six years later. This was the wall as a low-profile rampart with a ditch in front. 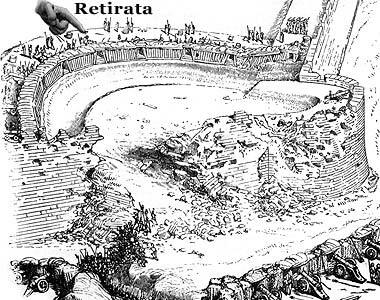 What the Pisans made was referred to as a "retirata." The Venetians expanded on the retirata for their defenses at Padua in 1509. A retirata was a 'make-do' retrofit. After Pisa and Padua, the basic concept of its rampart and ditch was put to use in the development of new defenses to replace the old. Low, thick walls, with a base considerably wider than the wall's height, could not topple over. With an interior of fill, usually earth and/or rock, such a wall could absorb one cannonball after another (in the days before exploding shot was fired from cannons). Low, thick walls became the fundamental strength of a new type of defensive design.